Rainbow Six returns to deliver the tensest close-quarter battles ever experienced online. In this episode, Rainbow faces independent terrorist threats, tied together by one common element--the Legion virus. Rainbow must determine the connection between the terrorist threats and the virus. Change in story and mission composition: Rainbow faces independent terrorist threats tied together by one common element--the Legion virus. Rainbow must determine the connection between the terrorist threats and the virus. 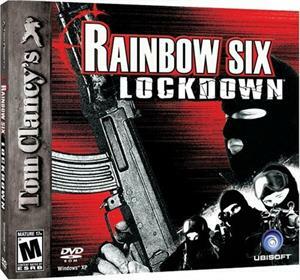 Superior multiplayer experience: Lockdown has the total multiplayer experience, including a revolutionary class-based mode where players choose from four specialized operative classes, each with unique gameplay advantages. Advanced weapons and equipment: complete your mission with all of the tools of the trade including new items like lock fusers, laser trip mines, and the deadly virus grenades. New "classic" maps: Rainbow Six Lockdown provides nine maps including three new "classic" Rainbow maps voted on by the fans. Tension-building sound effects (creaking floorboards, whispers, and hostages begging for their lives) hint at a threat around every corner. Increased visuals: All levels contain increased visuals, accomplished by increasing resolution of textures and increasing polygon counts. In addition, lighting of spaces dramatically improves the visuals of the game. All new user interface includes new radar element added to the game HUD--part of the motion-sensor vision mode.